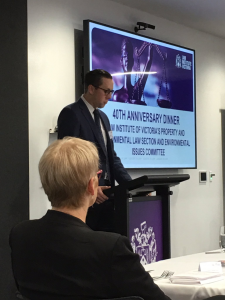 Last night, the Environmental Law Section (ELS) of the Law Institute of Victoria (LIV) celebrated its 40th Anniversary. Celebrations were held at the LIV William Street premises in Melbourne. Our Kellehers Australia lawyer, Hubert Algie, chaired the evening. Hubert opened the event by referring to Sir Garfield Barwick (then Chief Justice of the High Court of Australia) of the original Sections launch which emphasized the role of lawyers to help lawmakers create more practical law, which achieves its intended objectives. Amanda McKenzie, CEO, Climate Council, delivered the keynote address and spoke of the challenges of global warming and achievable ways of preventing it. As well as the influence of electoral funding in the development of strong political policy and action. 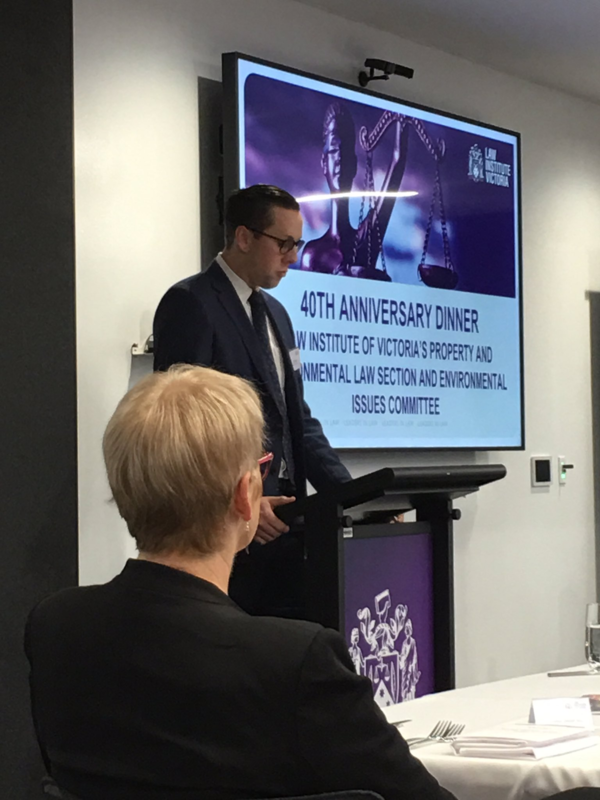 Acting Justice Molesworth AO, QC NSW Land, and Environment Court inaugural Section Chair spoke of forty years of Australian environmental law. Justice Molesworth AO, QC saw this recently expressed in (what he considered one of the finest pieces of judicial writing) Chief Judge Preston’s decision in Gloucester Resources. He pointed to public responses to Preston’s judgment as exemplifying the difficulty in establishing a reasoned debate on climate change and environmental law more generally. The ELS (now Property and Environmental Law Section and Planning and Local Government Sub-Committee), of which Dr. Kelleher was a founding executive member was the first professional environmental law group in Australia. The Section led directly to the formation of the National Environmental Law Association (NELA) and other similar environmental and property law groups in law societies throughout Australia. Justice Molesworth AO, QC emphasized the ground-breaking character of the ELS – forty years ago, the word “environmental” carried negative connotations of association with radical environmentalist movements. 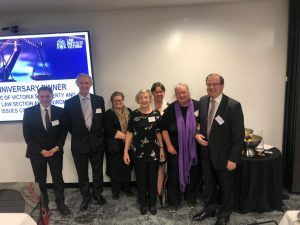 The celebration recognized the Section’s immense contribution to the law in the Planning, Property, Local Government, Environmental and related areas over the last 40 years. It looked to the future of environmental law – and the challenges it may face in its next 40 years. A special edition of the Law Institute Journal published this month also marked the occasion. It looks to the future and exploration of environmental challenges. Both Dr. Kelleher and Hubert Algie have articles published in this special edition. This fact sheet is intended only to provide a summary and general overview on matters of interest. It does not constitute legal advice. You should always seek legal and other professional advice which takes account of your individual circumstances. Gloucester Resources Limited v Minister for Planning  NSWLEC 7.